A great balance of sweet and peat with a dash of heat. John Distilleries was founded by Paul P. John in 1996 in India. To say that their growth has been amazing is to seriously understate things, because in just twenty years they have become one of the largest independent spirits companies in the world. From their three large production facilities they serve up a broad range of products, including Wines, Brandies, Whiskies, and specialty spirit brands. 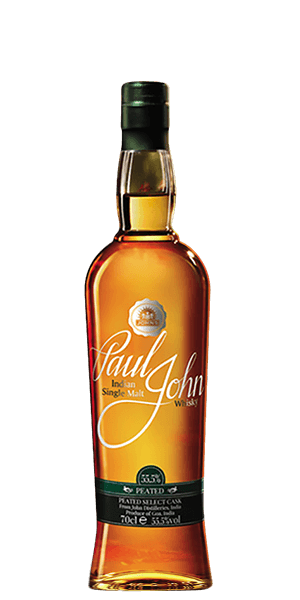 The Paul John line of Single Malts are created in the newest distillery in Goa on the west coast of central India. Their seven varieties have been recognized with international awards for quality since their first releases. The Paul John Peated Select Cask is made from local malted barley, but the peat is imported from Scotland. Every detail is attended to. It has been aged in ex-Bourbon casks and bottled without chill-filtration at cask strength — a whopping 55.5% ABV. It’s a rich, thick, and powerful expression of one of the best spirits to come out of Indias thriving Whiskey industry. Namaste! What does Paul John Peated Select Cask taste like? The Flavor Spiral™ shows the most common flavors that you'll taste in Paul John Peated Select Cask and gives you a chance to have a taste of it before actually tasting it. Light peat smoke and roasted walnuts with salted caramel. Well-balanced with campfire smoke, warm herbs, warm spice, and hints of papaya. Whiskey from India—who knew? And it’s not too bad! I’m glad I tried it! Awful!!! Smelled like bactine and tasted just like it smells! Had to put them out. Couldn’t even slam it down! I was really excited to try this one. Sadly I wasn't as impressed as I though I would be. For me - not bad but nothing to write home about. Full bodied and peaty with a clean finish. If you like phenols this is your dram. If you want any other flavor at all - this one isn't for you. Smelled very strong, wasn't very smooth. The initial taste was kind of like rubbing alcohol but the after taste wasn't bad. Did not like this whiskey. Smelled like oil. Not a fan. Nice smoke on the nose. Balanced sweetness followed by spice and heat.